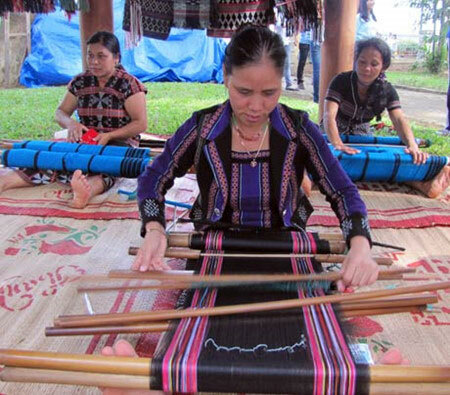 The Ministry of Culture, Sports and Tourism has recognised “Zeng” weaving in A Luoi district, the central province of Thua Thien – Hue as a national intangible cultural heritage. The information was revealed by Director of the pronvicial Department of Culture, Sports and Tourism Phan Tien Dung. Head of the culture and information department in A Luoi district Le Thi Them said “Zeng” weaving is a traditional craft of Ta Oi ethnic people. “Zeng” textile is indispensible in important events, creating a unique feature of Ta Oi people in particular and the ethnic community in A Luoi in general. The craft has been preserved through many generations, she said, adding that women play a significant role in teaching their daughters to weave “Zeng” patterns. In marriage, a bride should know how to make beautiful “Zeng” items to present to her husband’s family members. “Zeng” products feature the unique culture of Ta Oi ethnic people, she said, noting that “Zeng” weaving has helped create jobs for many local residents. Mai Thi Hop, owner of a “Zeng” weaving facility in A Luoi, said diverse “Zeng” products have become popular for visitors to the district./.